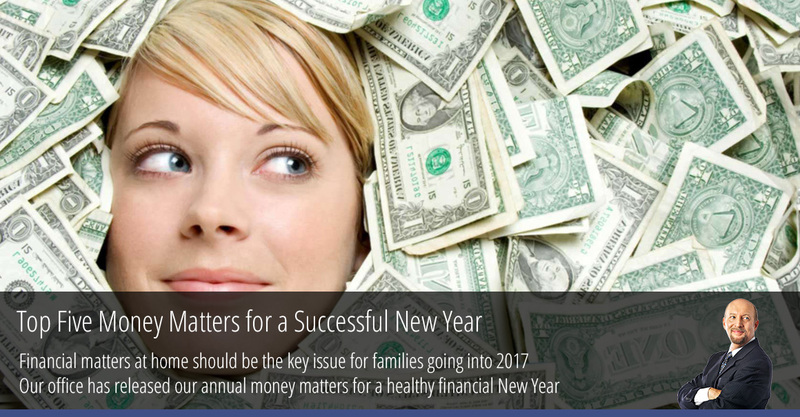 Top Five Money Matters for a Successful New Year | Queens Bankruptcy Attorney - Bankruptcy Lawyer in Queens - Bruce Feinstein, Esq. Many people are reluctant to look back over their annual spending for fear of seeing where they spent too much and didn’t save. But we recommend reviewing the year’s financial statements to find patterns in spending and get a starting point for your annual budget. You can’t take a step towards financial well-being until you know where your problem areas are. We all have them. Don’t look at your previous year’s income and debt as a burden, look at it as an opportunity to see where you spent too much and where you saved well. One great way to start this is to look at the year’s bank statements. You can also contact your bank to request a simplified expense report. This way you can track spending have a starting point for creating an easy-to-manage budget for the upcoming year. Once you and your family have a solid understanding of your spending habits, you can start preparing for your financial future. This includes making a will, naming a power of attorney, or developing end-of-life plans. Many people see planning for end-of-life care as depressing. But what’s truly depressing is being unprepared for an unplanned health event or the rapid decline of an aging family member. Properly planning your estate will prevent financial headaches down the fine and possible financial repercussions for your loved ones. Student loan debt has been a growing issue for most families in the U.S., and our office has discussed this problem frequently, including ways to discharge student loan debt during bankruptcy. However, there are still ways you can save for your child’s education in order to lower his dependence on student loans down the line. Start investing as early as possible in a child’s college education. One good approach is to open a 529 account. This account lets you make recurrent tax-free deposits. And depending on which state you live in, you can receive an additional tax deduction for contributing for a 529 plan. So while the policy theories swirl around about ways to relieve the enormous student loan debt in the U.S., your family can take steps toward helping your children’s financial future. We all know New Year’s resolutions are hard to keep. But taking an overall “less is more” attitude toward spending can be a simple approach to saving move and reducing debt. This can mean spending less on a credit card, paying off a high interest credit card balance, or cutting unnecessary expenditures like eating out frequently. Keep in mind what you want to save for, because simply spending less feels unfulfilling. If you know you want to save for a new home, a child, or a car, then you have a positive outlook on saving. Finally, money issues should not be a private endeavor. I’ve worked with many spouses and families in bankruptcy who don’t share money matters, whether it’s a hidden credit card or unpaid loan. Make financial planning a family effort; it has multiple benefits. It takes the burden off of to deal with a financial issue alone. It also inspires better communication between you and your spouse or partner. And if you have children, teaching them basic financial skills increases their financial mindfulness and gives them an invaluable life skill. Teaching children about saving money and even the most basic financial concepts is one of the best things parents can do. It also helps parents really focus their family’s needs. Creating transparency helps everyone involved. Our office would like to wish you and your family Happy Holidays and Happy New Year!